CDC endorses use of N95 Respirators. Unique, Patented Design* A traditional, 3D cup-shaped respirator with away-from-the-face comfort yet it folds flat for easy storage and portability! 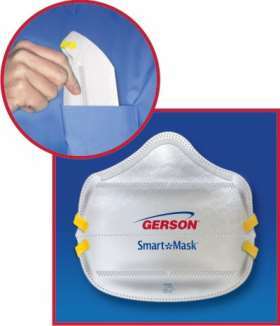 Its also available in a sanitary individually-sealed bag and the SmartMaskTM opens to a comfortableto- wear, 3D cup shape! Either way, its a truly revolutionary design that offers the best of both worlds. Plus patented side panels provide added surface area that lowers the breathing resistance up to 40% over traditional molded respirators. No wonder we call it the SmartMaskTM! FDA 510(k) approved 2130 only. Helps Protect Against Swine Flu, Avian Flu, SARS, Smallpox and Tuberculosis.